While we’re used to seeing and hearing content on the Internet, smelling it has never really had much of a look in. That changes with the launch of a cool new product from London’s Mint Digital Foundry. 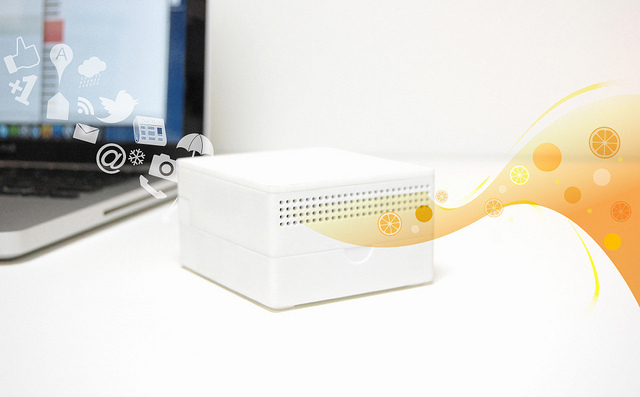 Olly is a USB-powered device which takes events on the Internet and turns them into smells. Just got a reply on Twitter or a ‘like’ on Facebook? Maybe a new email or calendar reminder? Olly can be set to notify you by filling the room with a fragrance. A slide-out tray at the rear of the device can be filled with a source for a scent – maybe essential oils or a slice of fruit. Although each Olly device can only deal with one notification smell, you can stack a number of them up to alert you to multiple different types of event with different smells. Mint’s Foundry, a research team exploring the relationship between physical objects and the Web, has documented the development process for Olly in multiple posts over the past few months on its blog and now the device is said to be in a fully working state. Olly is a completely open device, meaning that users are free to modify it or reprogram it as they like. While Mint is still working out how to turn Olly into a mass-produced device that anyone can buy, if you have access to a 3D printer and are handy with a soldering iron, you’ll soon be able to build your own, once the instructions are published. In the meantime, we can all just marvel at an incredibly neat idea brought to life.